Internationally renowned and leading Pakistani human rights advocate Asma Jahangir has died, a family member said Sunday, in a stinging blow to the country’s embattled rights community. She was appointed United Nations Special Rapporteur for human rights in Iran in September 2016 and delivered regular reports on the prevailing situation in the country to U.N. bodies. Jahangir who was 66 died of cardiac arrest, according to her sister. “Unfortunately we have lost her,” Hina Jilani, also a prominent rights activist, told AFP. Jahangir’s supporters and former opponents alike took to social media to offer their condolences and expressed shock at the news of her death. 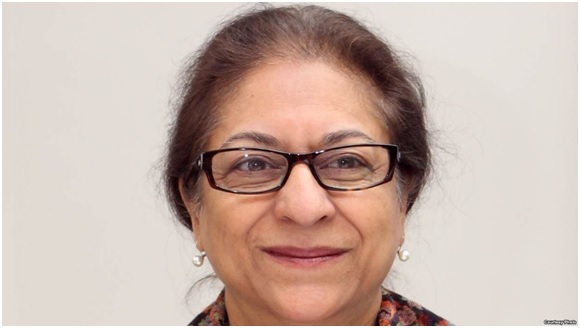 “Asma Jahangir was the bravest human being I ever knew. Without her the world is less,” wrote prominent Pakistani lawyer Salman Akram Raja. “I and many others didn’t agree with some of her views. But she was a titan. And one of the brightest and bravest ever produced by this country,” wrote journalist Wajahat Khan on Twitter. “Deeply saddened by the news of sudden demise of renowned lawyer and human rights activist Asma Jahangir sahiba. Pakistan has lost a passionate champion of human rights and a staunch supporter of democracy. May her soul rest in peace!,” Punjab’s provincial chief Shebaz Sharif tweeted. Jahangir received France’s highest civilian award in 2014 and Sweden’s alternative to the Nobel Prize for her decades of rights work. Few Pakistani rights activists have achieved the credibility of Jahangir. She braved death threats, beatings and imprisonment to win landmark human rights cases and stand up to dictators. There is still terrible violence against women, discrimination against minorities and near-slavery for bonded laborers, but Jahangir told AFP during an interview in 2014 that human rights causes have made greater strides in Pakistan than it may appear. Jahangir secured a number of victories during her life, from winning freedom for bonded laborers from their “owners” through pioneering litigation to a landmark court case that allowed women to marry of their own volition. She was also been an outspoken critic of the country’s powerful military establishment, including during her stint as the first-ever female leader of Pakistan’s top bar association. She was arrested in 2007 by the government of then military ruler Pervez Musharraf, and in 2012 claimed her life was in danger from the country’s feared Inter Services Intelligence (ISI) spy agency.